I never make pizza because I always think that it's going to take all day. I'm not really sure why I had this in my head, because this pizza took less time than most of the other things that I've made lately. I spent about 15 min making the dough last night, and 20 min making the pizza (including cooking time). I'm glad this recipe caught my eye and got me over my pizza drought. Take dough out of refrigerator at least an hour before you want to make the pizza. Before you assemble the pizza, preheat oven to 450. Oil the bottom of a baking sheet (but see below for info on baking stone). Pull dough into a very thin circle (about 12" in diameter) and put on baking sheet. Heat oil over medium heat, and saute onion until tender. Add garlic to onion, and saute for 1 min. Combine onion and garlic, beans, cumin, and chili powder and spread on top of dough. Spread salsa evenly over beans. Quickly saute spinach (just until it starts to wilt), and let drain to remove moisture. Spread spinach over salsa. Sprinkle with tabasco, and then sprinkle cheese on top. Bake until dough is nicely browned, about 8-10 min. Serves 2. You could also use a baking stone, if you happen to have one. In this case, preheat the baking stone and assemble the pizza on the back of a baking sheet or a pizza peel that's been sprinkled with cornmeal (don't oil it). Slide the pizza onto the baking stone once it's assembled. Combine flour, salt and yeast in large bowl. Stir in oil and water, and mix with spoon until all of the flour is incorporated. Knead by hand for 5-7 min until dough is sticky and elastic (I've noticed that it's a lot easier if your hands are wet before you start kneading). You could also use a mixer with a bread hook, if you're lucky enough to have one of those lying around. Put dough on a floured surface and cut into 6 equal pieces. Form each piece into a ball and rub with olive oil. Put each ball in a separate ziploc bag and put in refrigerator overnight. Before you use dough, let it sit at room temp for at least an hour. If you're not planning on using dough in the next few days, throw the bags in the freezer instead of the refrigerator (I froze 5 and kept one out for tonight). To thaw dough, put in refrigerator the day before you're planning to use it. This pizza was very good, and I'm happy that I have more dough in the freezer. The crust was good - definitely a thin crust style with a good simple flavor. What I like most is that the toppings were great and weren't overpowered by cheese. Don't get me wrong - cheese has it's place in some pizza (especially if you're talking about fresh mozzarella on a good Margherita pizza), but it shouldn't overpower the other toppings. Perhaps I would feel differently if massive amounts of cheese didn't make me sick, but who knows. The only potential problem is that the crust got a little moist from the toppings. To avoid this, I bet that you could use raw spinach and put that down on the dough first to protect the crust from the moisture of everything else. It might also help to cook the dough for a couple of minutes before adding the toppings. I would hate for those with wet bread phobias to avoid this pizza just because of the moisture :). You can look forward to several more posts about pizza. In fact, I may make it a weekly event, so feel free to tell me about your favorite toppings. I already have several things in mind, but I might as well start making a list! Heat oil over medium-high heat in saucepan. Add curry paste to pan and cook for 2 min. Add lime zest, fish sauce, soy sauce, sugar, and coconut milk. Reduce heat to medium-low and cook for 5 min. Add shrimp and cook for 5 min, stirring occasionally. Serves 2. This was delicious, and I had to stop myself from eating the entire thing. I served it over brown rice with spinach on the side, and the spinach was great for soaking up the extra sauce. The original recipe called for lemon grass, kaffir lime leaves (instead of the zest), and Thai basil, but unfortunately the Asian market that I stopped at doesn't carry Thai foods, so I had to do without. I bet it would have been even better if I could have used those. You might remember that I was nervous about enjoying the leftovers of my butter bean, butternut squash, and sausage pasta. Well, never fear... the umami gods were looking out for me. I made more grilled romaine hearts to have with the pasta, and drizzled soy sauce on the lettuce. Some of the soy sauce happened to make its way over to my pasta, and the result was amazing. It wasn't the addition of the soy sauce taste, per se, but the fact that it heightened the other flavors. I immediately knew that I was experiencing the wonders of umami! You hear a lot about umami (the 5th taste). Supposedly meat, parmesan cheese, mushrooms, soy sauce, red wine, and a variety of other foods activate taste buds with umami receptors and enhance other flavors. I had never experienced it before and honestly thought it was one of those things that gets tossed around by chefs and foodies to make themselves feel important. And I was wrong. Sometimes it feels (or in this case, tastes) so good to be wrong. On a completely different note, I have embraced one of Rachel Ray's tenets. The woman drives me crazy... it's just not normal for someone to be that excited about everything. Calm down, woman! But, I still watch 30 Minute Meals from time to time because I think she makes some good food. Anyway, I've realized that she's on to something with her garbage bowl (or "GB," because there's not enough time to make a meal and say everything in just 30 min). She keeps a big bowl by her cutting board and puts all of her random garbage in it - everything from veggie stems and peels to empty containers. I was tired of leaving a trail of onion skin from my counter to the garbage can, so I gave it a shot. I highly recommend this simple practice. My floor stays a lot cleaner (although I still managed to spill oats all over it the other day), and it only takes a few seconds to wash the bowl out at the end of the night. Rachel, you win this time. Nothing makes me think of winter more than root veggies. And nothing is better than roasting them. It's simple, delicious, and I never get tired of it. Peel veggies and chop into small, equal-sized pieces. If center of parsnips are really hard and woody, you might want to cut that out. Toss veggies with olive oil and herbs. Roast at 400 for about 40 min, tossing occasionally, until tender and starting to caramelize. Serves 3-4. It's amazing how sweet these veggies can become. I eat a lot of carrots, but it's always nice to throw some rarely-used veggies in with them (I forgot how much I love parsnips!). The only problem with these is that I tend to burn my hands and tongue because I can't wait for them to cool off before shoveling them into my mouth. I love butter beans. I love them when they're cooked to mush and you have to basically have to eat them like soup. But, I also love them when they still have some shape and some texture left. It's hard to find them in Michigan... first of all nobody has ever heard of a butter bean. You can occasionally find dried "lima beans," and I might be able to come up with a can of them. I want fresh... or at least frozen. So, while I was in Florida I bought several bags of frozen butter beans (both green and speckled), as well as a huge bag of zipper peas. I wanted to get a bit more creative than cooking them by themselves, so I was excited to find a recipe that pairs them with butternut squash and pasta. I had a few links of Amish turkey sausage left in the freezer, so I decided to throw that in too. Brown sausage in large skillet. At the same time, put squash chunks in food processor and pulse until it's shredded. Once sausage is brown, add squash, butter beans, salt and pepper, and about 1/2 cup water. Cook for about 15 min, until squash is fully cooked. Continue to add water by the 1/2 cup as it dries out. Once squash is almost done, cook pasta according to package directions. Add nutmeg to squash while pasta is cooking. When pasta is done, reserve 1 cup liquid before draining. Then drain pasta and add to squash mixture, adding cooking liquid as needed to moisten. You could add freshly grated parmesan before serving (I meant to, but forgot). Serves 4. *You can roast the rest of the squash chunks in the oven (I like to toss it with olive oil and thyme before throwing it in a 450 degree oven for about 30 min), but it also cooks well in the microwave (cover it and cook on high for about 4 min, until tender). This was good and different... better than I expected. I wasn't sure what it would be like, but I like the sweet and savory combination. However, this is the kind of "different" dish that I get tired of fairly quickly. I hope I'm still enjoying it by the time I get to the 4th serving. Oh, and by the way, I used Heartland whole wheat pasta for this. Their pasta tastes great, and it doesn't make you think that you're chewing through cardboard. I can only find it at natural foods stores, but it's not very expensive and is actually 100% whole wheat (unlike most of the "whole grain blends" at the grocery store). I saw a recipe for grilled romaine, and immediately jumped at the chance to use my grill pan again. Grill romaine halves over medium heat for 2-3 min per side, until browned and wilted. Sprinkle with vinegar, pepper, and sunflower seeds. Serves 1-2. This couldn't be easier. In fact, it probably takes the same amount of time that it would take to cut up the lettuce and make a salad. It's good, light, and easy. What more could you ask for? I think I'll try several variations throughout the week... maybe some soy sauce next? I love stuffing things. I'm not sure why, but it's an easy and pretty way to serve things. I've been looking for a way to use millet, so I decided that I could adapt another recipe and stuff it into peppers. And what better way to use more of my lifetime supply of venison! Heat oil in large skillet over medium heat. Saute yellow onions until tender. Add sausage and cook until it's cooked through. Add green onions, garlic, corn, and spinach and cook until spinach is wilted. Remove from heat, stir in cilantro and millet, and stuff into peppers. Cook at 400 for about 30 min, until peppers are tender. Serves 4. * To cook millet, sort and rinse 1/2 cup millet. Put in saucepan with 1 cup plus 2 Tbsp water, 1 tsp olive oil, and 1/8 tsp salt. Bring to a boil, reduce heat to low, and let simmer until all water is absorbed (about 15 min). Remove from heat and let sit for 10 min. This is amazingly good and I LOVED the millet. It has a great flavor, and puffs up just like rice. I don't know why people don't eat this more often because it's delicious. You could use any grain here (the original recipe called for rice), but I highly recommend the millet. In general, I love recipes that are completely adaptable to what you feel like throwing in. I recommend including the corn, though, because it gives it a great crunch. After the millet experiment, I've decided that this year I want to eat all of the whole grains (including the ones I've had before). I've had brown rice, oats, quinoa, corn, wheat, and millet this month. Now time for amaranth, barley, buckwheat, bulgur, farro, wheat berries, kamut, rye, sorghum, spelt, teff, triticale, and wild rice. I have most of these already, and I'm hoping that I can find the rest. I suppose I may have to make an exception if I can't, and I may exclude rye because I know I'm not a huge fan. I'm already dying to make more wheat berries and bulgur, so I'm sure I'll get to those soon. Hopefully I'll find more that I love! The other day I was reading about cherimoyas at Food Blogga. It's an ancient Incan food, and apparently Mark Twain described it as "the most delicious fruit known to man". When I saw one at Meijer yesterday, I had to try one out. The one I bought was already ripe (it was slightly soft and brownish). To eat it, you cut it open and scoop out the flesh, avoiding the big seeds. They have a distinctive tropical taste. I tasted banana, pineapple, and coconut, and maybe some mango. It's not overwhelmingly flavorful, and only subtly sweet. It was just enough to make me picture Hawaii. I wouldn't describe it as the most delicious fruit (especially at $4.99/lb), but that might be because it was shipped across the country to get to me. I'm glad I tried it out, though, and I'm always up for a fruit adventure! Over the last 6 months I've tried several granola and protein bar recipes. I love having these around because they're a great snack, especially after working out. With each recipe, I've wrapped up the bars individually and then stored them in the freezer. All of them froze very well (for up to several months, in some cases). I definitely have a favorite, and once again, Alton Brown wins. Combine protein flour, oat bran, flour, wheat germ, and salt in large mixing bowl. In separate bowl, whisk tofu until smooth. Add applesauce, honey, eggs, and peanut butter and mix well. Add wet mixture to dry mixture and blend well. Add in fruits and nuts and stir well. Pour into 13x9" pan that's been lined with lightly-oiled wax paper. Bake at 350 for about 35 min until it's browned. Let cool and cut into 24 bars with pizza cutter. These things keep me very full, and I love their flavor. They're more cakey than your traditional granola bar, but I like the texture. My favorite batch is the one that I'm currently working on, and it has a combo of raisins, dates, apricots, and pecans. The protein powder is expensive, but it makes quite a few batches of these. Make sure you read the labels and look for one that doesn't have a bunch of added ingredients. I'll probably stick to making these for a while. With fruit and nut variations, I think I can keep them exciting. My second favorite recipe also came from the Food Network. It's good, but doesn't quite live up to Alton's. Put all ingredients except for honey and eggs in food processor and pulse until well blended and finely chopped. Add honey and eggs and pulse until well mixed. Pour into 13x9" pan that's been lined with lightly-oiled wax paper. Bake at 350 for about 20 min, until browned. Let cool and cut into 24 bars with pizza cutter. These are more like your traditional granola bar. They have good flavor, but don't keep me quite as full because they don't have as much protein as Alton's bars do. I'm impressed that my cheap food processor is able to cut through all of the dried fruit! And finally, my third favorite. Toast oats in skillet over medium heat for about 5 min. Let cool. Combine all dry ingredients (except raisins) in large bowl. In separate bowl combine all wet ingredients. Add wet ingredients to dry ingredients and blend gently. Mix in raisins. Pour into 13x9" pan that's been lined with lightly-oiled wax paper. Bake at 350 for about 30 min, until browned. Let cool and cut into 24 bars with pizza cutter. Again, these don't keep me quite as full as Alton's do. They're good, but don't have the fruity flavor that the other two have. Overall, all of these are far better than store-bought bars and don't have all of the weird ingredients. They're really easy to make and store well. You really can't go wrong! Grandmother was nice enough to give me a container of her vegetable soup while I was in Atlanta. There a very few things I love as much as Grandmother's vegetable soup. She traditionally serves it with cornbread, so I decided that I would have to do the same. But, while I was looking for the perfect cornbread recipe I came across a few for spoonbread. Apparently you can't really call yourself a southerner if you haven't had spoonbread, so I had to try some. Mix cornmeal and salt in mixing bowl. Add boiling water gradually, stirring well. Beat egg in separate bowl until it's light and fluffy. Beat milk into egg. Add egg mixture and baking powder to cornmeal and beat with mixer until well blended. Pour into small buttered baking dish (I used loaf-sized glass dish, but ideally it would be smaller) and bake at 375 for about 40 min, or until set and brown on top. Serves 2-3 (depending on your self control). Stop reading this now and go make yourself some spoonbread. This stuff is delicious! It's lighter than cornbread (sort of a cross between cornbread and corn souffle), but still has the great corn flavor. And I can't imagine making anything easier. I still love cornbread, but this is a very nice alternative. I'm making an effort to cut down most recipes so that I can make more dishes every week, but I'm wishing that I had made the full recipe of this. There are very few things that I love more than Grandmother's soup, but there is virtually nothing that I love more than her soup and spoonbread. I just learned that they're officially called brussels sprouts, not brussel. It's a good thing I don't write about them very often. Anyway, I'm often wary of brussels sprouts recipes because it's so easy to let the sulfur taste get out of control. But, what's life without a little bit of adventure. Bring a medium pot of water to a boil. While this is happening, trim stem of brussels sprouts and discard loose outer leaves. Add salt to boiling water and boil brussels sprouts until almost tender, about 4 min. Drain and cool. Slice crosswise into thin strips and set aside. Heat oil in skillet and saute onion until golden, about 5 min. Add garlic and cook until fragrant, about 1 min. Add brussels sprouts and cook until they've browned slightly, 5-7 min. Add vinegar and cook 1 min. Stir in pine nuts. Serves 2-3. This book wins again. There was no sulfur taste here, and they were quite tasty. Balsamic and pine nuts make just about anything taste great, and this was another great example. This dish made up for the less than exciting quinoa. I like quinoa and haven't had it in a while. In fact, I don't think I've had any since I made several gallons of it while I was in Florida (ok, I'm exaggerating a little bit, but not much). So, tonight was the night to make more. Heat oil over medium heat in saucepan. Add onions and spices and cook for 5 min. Rinse quinoa well and let drain. Add quinoa to pan, and then add water. Cover and bring to a boil. Reduce heat to low and let cook for 15-20 min, until all water is absorbed. Remove from heat, place dish towel under lid, and let sit for 5 min. Stir in raisins, pine nuts, and cilantro. Serves 3. This was ok. It had potential, but was too bland. The spices need to be doubled, and the quinoa definitely needs to be cooked in some sort of broth. In some bites the cinnamon flavor came through, and those bites were really good. I'm glad I accidentally added more raisins than the recipe called for because that salvaged it. This recipe might have worked with other grains that have more of a flavor on their own (like bulgur, barley, or even a flavorful rice), but not so much with quinoa. Oh well. I still have salmon in the freezer, so I figured I would pull some out for tonight. Place salmon fillets skin side down in a baking pan. Sprinkle with salt. Place tomato slices over salmon. In a small bowl, whisk together cumin, oil, lemon juice, garlic, and cayenne, and pour over fish. Cover pan and bake at 375 for 20 min, until fish flakes. This was good. Subtle, but good. It wasn't a whole lot different than baking salmon on its own, but the tomato was a nice addition. Perhaps it would have had more flavor if I added the sauce before the tomatoes. I concocted this dish while I was at home. We had a lot of spinach that needed to be eaten, but I was tired of salads, so I decided to saute up a bunch of things. It's a great option when you're in need of a quick veggie dish. Saute onions in olive oil until they're tender. While you're cooking veggies, toast sesame seeds in dry skillet over medium heat until fragrant (about 5 min) and set aside. Add garlic and tomatoes to onions and let cook for a minute or so. Add spinach (in batches, if necessary), cover, and cook until wilted. Stir in Sriracha sauce. Sprinkle with sesame seeds. Serves 3. I added the sesame seeds this time, and although the flavor doesn't come through because of the spice, they add a different texture. I could eat spinach every day (and some weeks I do), and this is a nice change from salads. This is a good recipe to play with... perhaps next time I'll use crushed red pepper instead of Sriracha. You really can't mess it up, and that's the kind of recipe I like. This book is repeatedly mentioned on The Splendid Table, which I habitually listen to via podcast (or when I happen to be in the car at 2 pm on Sundays). Russ Parsons is often on the show discussing a simple fruit or vegetable recipe, or giving tips about them. I've been meaning to look for the book for a while, but finally got around to requesting it from the library the other day. To sum it up, this is one of the best books I've read about how to choose, store, and prepare fruits and vegetables. And everything is grouped by season! Plus, he gives a nice story about how each one got its start on an American farm, and how it has evolved based on consumer whims, ease of transport, and marketing. 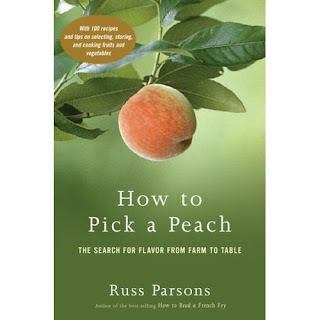 Parsons does a great job describing different varieties of fruits and vegetables, and the dishes/techniques that are best for each one. 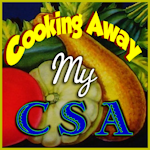 After listing where that type of produce is typically grown and giving advice about how to choose the best one in the store, where to store it, and how to prepare it, he gives several recipes highlighting that item. For some reason very few of the recipes jumped out at me, but maybe that's because I like very simple vegetable recipes, and rarely do anything with fruit other than eating it whole. The other parts of the book are fabulous, though. One of my favorite things is that he gives explicit details about which items should be stored in the refrigerator. Most of my knowledge of this came from watching Mom and Dad, but I realized that in some cases they're wrong. I already knew that you should never keep regular onions and garlic in the refrigerator (I keep telling you guys...), but the sweet varieties (like vidalias) should be in there. And apparently lemons and limes last much longer if kept at room temperature. Perhaps I'm one of few that didn't realize this, but I immediately jumped up and took mine out of the crisper drawer. If I didn't already love the book for its entertaining histories and great tips, Parsons definitely won me over with his description of Red Delicious apples, calling them "a perfect example of the ruination of industrial agriculture" and "mealy and insipid, with a bitter finish." I couldn't have said it any better. This is one of the simplest things to make, but it's one of my favorite post-workout snacks/desserts. I eat this quite often and am still not tired of it, so I figured I should share. Mix flax with yogurt. Add fruit. How to you make yogurt even tastier? Add flax and fruit. I love flax seeds and meal, and I eat a ton of it. It's loaded with Omega-3s, but I mainly care about the fact that it has a delicious nutty flavor. I've used several types of fruit in this - mostly blueberries and grapes - and all are good, but different. My favorite is probably frozen grapes, although frozen blueberries (especially my quickly depleting stash from the summer farmers' market) are great too. This week blackberries were on sale (I still can't figure that one out...), so I decided to have a nice treat. I had to teach myself to like plain yogurt, but it became easier once I discovered how much better organic yogurt tastes than regular. I typically buy either Stonyfield Farm or Brown Cow, and both are delicious. I'm still searching for a local yogurt source. I've been buying all of my milk and butter from Calder Dairy in Carleton, MI (and it's amazing! ), but they don't make yogurt. Hopefully I'll be able to find something soon. Last night I had plans to go to a friend's house for a movie night. I wanted to bring some snacks, but decided that I should do something simple. I found this delicious-sounding recipe, which seemed perfect given that avocados are on sale this week. I don't buy avocados that often, and I'm not sure why, because they're incredibly delicious. Avocado and Bean Dip (adapted from "Moosewood Restaurant Low-Fat Favorites"
Obviously we enjoyed it. It's simple, and has a very fresh taste. Next time I might also add some chopped fresh tomatoes (especially if I make it during the summer). This was another great use of my frozen beans! I needed a side for my Tandoori chicken, and I figured that it couldn't hurt to get more greens and peas in me because I didn't have any on new years day (don't worry, I got some the next day). This year I need as much luck as I can get. Sort and rinse peas. Soak peas in 2 1/2 cups water in saucepan for 15 min. Bring peas to a boil over medium heat. Reduce heat to low, stir in turmeric, and allow to simmer until peas are soft and water is absorbed (about 25 min). Set peas aside. In a large pot, combine spinach, turnip greens, collard greens, and 2 Tbsp water. Cover and cook over medium heat until greens wilt and water is absorbed (5-10 min). Set aside. In a large skillet, heat oil over medium heat. Add ginger and chiles and saute for 1 min. Add mustard seeds and cumin seeds and saute, stirring continuously, for 1 min (be careful - the mustard seeds will pop all over the kitchen if you let it go longer). Add the peas and greens and mix well. Add lime juice to taste. Serves 5. It's still really cold. The wind chill is supposed to climb into positive numbers today, but this morning we got about 5 inches of snow. You just can't win. So, I decided to pretend that I'm in India. It worked. Or perhaps it was the heat of the oven and stove.... either way, I'm warmer. Mix yogurt, lime juice, ginger, garlic, and spices in shallow bowl. Rinse chicken and cut deep slits against the grain. Put chicken in yogurt mixture, turning to coat, and make sure that marinade gets into all slits. Cover and put in refrigerator for 2-12 hours. Preheat oven to 375 and put chicken on baking pan covered in foil. Bake for 35-45 min until juices run clear. Serves 4. This had great flavor and just the right amount of heat (reduce the cayenne if you can't handle any spice). It was a great dish to make with energy-consuming sides because you prepare it ahead of time and throw it in the oven and forget about it. It doesn't quite compare to the tandoori chicken at Indian restaurants, but perhaps the clay oven really does perform magic. Using boneless chicken (and white meat) probably also had a big effect. This was still great, though, and definitely warmed me up! I've been wanting to make cookies for a while, so this week I made it happen. Here's another recipe from Karen Barkie's "Sweet and Sugarfree." Beat banana and oil together until creamy. Beat in egg. Add remaining ingredients and mix well. Drop by teaspoons onto baking sheets and bake at 350 for 10 minutes, or until they start to brown around the edges. Cool on wire racks. Yields about 3 dozen small cookies. These are good, and definitely sweet enough (at least for me). It has a surprising amount of banana flavor for only having 1/4 cup. They have a huge amount of chocolate, so much that it couldn't all stick to the rest of the dough and tended to fall out onto the baking sheet. I would use far less next time just to avoid that. The original recipe calls for carob chips (which I would definitely prefer, but unfortunately didn't have), so I'll have to try it again some time. Ok, I finally caught up from the week, so that's the last post for tonight. Now that I've mastered the art of halving or thirding recipes, I've been able to try out more recipes, so look forward to more frequent posts! I had a head of cauliflower and was planning to save it for an Indian-themed meal, but was craving it tonight. I found some semi-affordable saffron at Oriental Mart, so it seemed like a perfect time to try this out. Combine oil and saffron in small bowl. Sit bowl on stove as oven heats to 400 degrees (to infuse some of the saffron flavor into the oil). Cut the cauliflower into small florets and spread out in baking dish. Sprinkle cauliflower with vinegar and garam masala. Then drizzle oil on top and toss until evenly coated. Roast in the oven until tender (about 30 min), stirring a few times. Grind pepper on top and serve. Serves 3. This was a very tasty (and different) way to do cauliflower. The recipe called for Ras el hanout or curry powder, but I decided to use garam masala because I love it so much. Next time I might use garam masala and curry powder (and maybe even turmeric!) to give it a little more flavor. I was probably too stingy with my pinch of saffron, but I'm trying to make it last. Roasting veggies is one of the techniques that I've used over and over recently because it's so easy never fails. Here's another great example. I love onions. I love apples. Cinnamon is heaven on earth. So what could be better than this dish? It came from "How to Cook Everything," and Bittman is definitely on to something with this recipe. Cook onions in covered skillet over medium heat for 10 minutes, stirring occasionally. Add oil, apples, and cinnamon. Reduce heat to low, cover, and cook about 10 minutes, stirring occasionally. Uncover and continue to cook until apples are completely tender. Serves 3. I just ate this as a dessert. Call me crazy, but the apples and onion caramelization make it work. The oil could be cut down to 1 Tbsp, but otherwise it's perfect (and so easy!). I've seen a similar recipe with brussel sprouts instead of onions, so I may have to give that one a try, too. It's been cold here. Brutally cold. We're talking wind chills in the negative teens and warnings about how exposed body parts will freeze. What could be better for that than chili? Plus, it gave me a chance to try out some of the hot venison sausage that I brought back from Florida. Heat oil over medium-high heat; add sausage and cook until it's browned and cooked through. Add onion, cumin, garlic, and oregano and cook until onion is tender. Puree half a can of black beans and 1/2 cup broth in food processor. Add this mixture, the rest of the beans and broth, and tomatoes (including liquid) to the sausage mixture. Bring to a boil, then reduce heat, cover, and simmer for about 45 min. Add lime juice before serving. Serve plain or over brown rice. Serves 3-4 if plain or 5-6 if served with rice. This is amazing. Definitely the best chili I've ever made. The heat of the sausage gave it great flavor without being too much. And I got to use my frozen beans! I served it over Massa Organics brown rice that I got for my birthday, and that made it even better. I made it for dinner tonight, but I can't wait to have more tomorrow. The original recipe called for 2 Tbsp chopped cilantro (added with the lime juice), and I would have included that if I had some. Otherwise, I'm not sure that I would change much. I try to avoid using canned beans because dried ones are far cheaper, don't have all the negative factors of canned foods, and don't come with a salty mush. But canned ones are so much more convenient! The solution: cook a bunch of dried beans and freeze in can-sized portions. So, I had a bean cooking extravaganza on Monday night and ended up cooking about 2 pounds of black beans, 1 pound of kidney beans, and 1/2 pound of great northern beans. I'm hoping to do more varieties once I clear out more space in the freezer. I rinsed them and soaked them all day (although I've been reading a lot lately about how this isn't necessary), then simmered them until they were almost done. If you're planning to use them in cooked dishes, I would stop them when they're still al dente, but for cold dishes I would cook them completely (but don't let them get mushy). Then I drained the beans, spread them out to cool, and packaged them in 1 2/3 cup portions in freezer bags. Another alternative is to pack them in 2 cup portions that include some of the cooking liquid. Or, you can spread them out in a single layer on a sheet pan and freeze them for a couple of hours, then pack in one big bag (this allows them to freeze individually so that they don't freeze into a block). This would have been ideal, but I didn't have the time or freezer space to make it happen. But, it's nice to be able to take a bag out of the freezer and throw it in the refrigerator in the morning and use it that night. I haven't had miso soup in ages, but I ran across several recipes for it lately, so I had to make some. I ended up adapting a recipe from Mark Bittman's "How to Cook Everything," which is a great reference and recipe book. Bring broth to a boil, then reduce heat to low. Saute mushrooms until tender and set aside. Remove a small amount of broth and mix with miso until it's smooth. Add this mixture, mushrooms, spinach, and green onions to remaining broth. Let sit for a minute before serving. Serves 4. I didn't like the smell while this was cooking, but I was pleasantly surprised that the taste was delicious. I used a dark miso that I bought before I knew the difference between the types, and I would have probably preferred a light miso. The mushrooms and spinach make it a fairly hearty (but extremely low calorie) soup. I've been dying to try out some of the recipes from a book called Practical Cooking: Wok and Stir-fry that I picked up at a used bookstore in Tallahassee. I haven't done much Asian cooking, but it's something that I want to add to my repertoire. Instead of picking a recipe and buying the ingredients, I tried to find a recipe that included things I already had (or could substitute). That's not usually how I do things, but it worked ok this time. Cube/crumble tofu and set aside. Heat peanut oil over medium-high heat in skillet, add vegetables and tofu, and cook for 3-4 minutes. Mix remaining ingredients in saucepan and bring to a boil. Add sauce to vegetables, reduce heat to low, cover, and simmer for 10 minutes. Serves 4-5. It turned out with a good flavor, but it was very saucy (almost to the point of soup). I'm not sure if that's because I adjusted the veggies in this recipes (it originally called for green onions, celery, broccoli, zucchini, and spinach), didn't use firm tofu, or what. After I scooped the veggies and tofu out of the sauce, it had a good, albeit subtle, flavor. Next time I would definitely get firm tofu. I was excited to serve this on soba noodles because the ones I've had in restaurants have been delicious. I wasn't keen on the flavor of these, though. They were made with buckwheat and yam, and perhaps I need to try the pure buckwheat ones. I'm not sure of the brand, but here's the package. I would avoid them. I was in a flustered mood when I made this, and that may not have been the best time to try out a new cuisine. It went fairly well in the end, and I'm excited to try out more recipes from this book. 1) more pictures. I definitely enjoy seeing pictures of other people's food, so it can't hurt to include pictures of mine. Unfortunately this means that I'm going to have to delete the non-food pictures that I put up on Picasa over the last couple of years because I won't have space for both. I haven't been taking many other pictures lately, but when I do I'll try to put them up on another site that won't compete with this blog for storage. 2) including recipes. I include most of the links for my recipe inspirations, but I like blogs that reproduce the actual recipes (giving credit to the source, of course). 3) giving each dish its own post. This means more updates, but hopefully it will make it more readable. And hey, most of them deserve their own space! I would love to hear more ideas about how to make this better, so feel free to leave any comments. I was planning to make miso soup tonight, but the weather gods did a good job of preventing that. When I left my apartment this morning there were a good 6" of snow on the ground, but the roads were fairly clear so I thought it would be fine to run a few errands after my volunteer info session at the zoo. During the 1.5 hr info session, it snowed a couple of more inches (and has been snowing ever since), and this turned the roads into complete slush. Days like this make me hate snow even more, because the only way to get where you're going is to turn the steering wheel and hope that you manage to slide far enough (but not too far!) to go in the direction you want to go. It's a truly frightening experience. Anyway, I cut down my list of errands to the vital ones, and as a result didn't make it to the asian market. My meal started out with Artist's Arrabbiata from the cold weather cookbook that Dad gave me. At first I didn't realize how appropriate this was -- "arrabbiata" means angry in Italian, which is exactly what the snow made me, and the recipe was from the section of the book with ideal dishes for storms. It's one of the most simple dishes you can make (basically you saute garlic and crushed red pepper in olive oil, add coarsely chopped roma tomatoes and let it simmer for a while, then pour on pasta), but it was so good. I love the heat from the pepper, and even though most of the tomatoes in the grocery store are pale pink, the romas still have some flavor in the winter. I can see this becoming a staple for me - it's quick, easy, and cheap. To go with the pasta, I decided to pull out the grill pan again and cook some veggies. I found some edible-looking eggplant and zucchini at the grocery store, and decided to go against my better seasonal/local judgement and buy it. I also grilled some onions, but apparently didn't cook them long enough because only the outer petals were tender and delicious (I'll fix that tomorrow). Let's just say that I'm not sure I'll be putting my grill pan back in the cabinet because I'm going to be using this thing to death. And at the last minute I decided that I could probably use more protein than what was in the whole wheat pasta, so I grilled up some tilapia that I had in the freezer. To make it go along with the Italian theme, I sprinkled an Italian herb mix on it. It was very good, although the highlight of the meal was definitely the pasta and veggies. I've done a bit of cooking since I got back to Michigan.... most excitingly I've tried out my new grill pan! I also managed to acquire tons of meat while I was at home (lots of venison, and a bit of pork sausage). Almost everything was frozen except for the pork sausage, so I decided to grill up some of that with onions and peppers for dinner on Saturday. It was really good (and for some reason the grill marks make it taste better). I'm pretty sure I could eat Bradley's sausage every day and not get tired of it, so I'm glad that I have more in the freezer! I also made the other package of soup that Mom and I got in Traverse City. This one is a mix of lots of beans and barley, and it's good, but not quite as good as the pea soup (and hopefully I'll remember that if I decide to buy more next time I'm in TC). Finally, today I grilled up some portobellos with cheese and onions. I think that yummy is the only proper description. Let's just say that I'm going to be grilling a ton of things for the next few months. I can't wait until squash and eggplant are in season because those are destined for my pan. In slightly related news, I've been rearranging my kitchen to provide more counter space and make it more useable. So far it's much better, and hopefully things will be perfect once my spice rack gets here. I'll probably get it exactly how I want it right about the time I'm ready to move, but then I'll have a new project with my new place (and I can't wait for that for SOO many reasons). I love cooking at home because I don't have to pay for groceries, I get a lot more counter space, and I get to cook more things because the leftovers disappear more quickly. But, I didn't cook as much as I thought I would because I was only really in town for about 5 days (despite being in FL for 2 weeks). I did get to try several new things, though. The first thing I made was a Cooking Light's butternut squash lasagna. I was nervous because I didn't know how I would like the mix of flavors, but it was really good. Next time I would use even more squash, and definitely a bigger pan (it overflowed a little). The sauce was simple, but very tasty (even though I didn't use the fire-roasted tomatoes), and I can see myself making this for all types of pasta. Next up was Christmas Eve dinner. I wanted to do something a little out of the ordinary, and what immediately came to mind was a dish that my friend Sam made a few weeks earlier - braised short ribs. I sort of followed Cooking Light's recipe for braised short ribs, but also used Sam's instructions. Basically, I sprinkled salt and pepper on the ribs, browned them on all sides, and set them aside. Then I sauteed sliced onions, celery, leeks, carrots, and garlic until tender. I then added about 2 cups of cabernet sauvignon, peppercorns, thyme, parsley, and a bay leaf and let that reduce until the wine had almost completely evaporated. Then I added a few cups of beef broth and poured that over the ribs, adding more broth so that they were almost covered. Then I covered the pan with foil and let it cook at 300 for 3 1/2 hours (at this point I picked up a piece of meat and the bone fell out). It was really tasty and probably the most tender beef I've had, but not an everyday recipe (because of time and money). I also made a mushroom, brown rice, and wheat berry pilaf from the Moosewood cookbook. It was really tasty, and I can't get enough wheat berries! Finally, I made roasted cabbage and potatoes from A Year of CrockPotting, but unfortunately I didn't know that the cooking temperatures on Mom's crockpot are way too low, so the potatoes weren't cooked. I've made it again in mine since I got back to Michigan, and it was really good. I also made some desserts sweetened with dates and fruit juice. The fudge had grape juice in it, and that's all I could taste. I didn't like it at all. However, the peanut butter chewies were very tasty, and I'm sure I'll be making them again some time. After that I didn't get much cooking done due to a lot of small trips to Atlanta, Gainesville, and Jacksonville (and because we had to eat up some leftovers! ), but I'm trying to make up for that now.